Late Monday, Apple approved iTether in the App Store. The $15 app’s description in the store is perfectly clear: iTether lets you connect your Mac or PC to your iPhone’s data plan—without requiring that you activate a tethering plan with your carrier. Early Tuesday, the app was pulled from the App Store. The app requires that you download a companion desktop app from developer Tether’s website; at this writing, the website is painfully slow to respond. 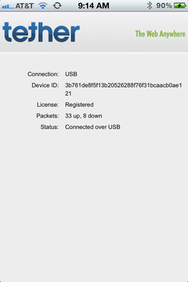 Once I was able to download the desktop client, I did successfully establish a connection between my MacBook Pro and my iPhone with the phone tethered via USB. Unfortunately, in my early testing, the desktop Tether app crashed a lot—taking the tethered connection with it. Apple’s approval of the app was a smidgen confusing. Back in July 2010, Handy Light snuck into the App Store, a secret tethering app that masqueraded as a flashlight app to trick Apple into approving it. (Apple unsurprisingly gave that app the kibosh after just a few hours.) Two years prior to that, Apple approved—and then pulled—the $10 NetShare app that offered functionality similar to iTether’s. Now, iTether has met the same fate. Unlike Apple’s officially supported, built-in tethering mechanisms in iOS, iTether appears to work only over USB. iOS offers support for Bluetooth and Wi-Fi based tethering, too. It’s clear now that Apple’s approval of iTether didn’t herald an App Store approval process policy change; rather, it seems that it merely reveals an overtired App Store reviewer mistakenly pressing the wrong button on the app. If you snagged the app before Apple pulled it, remember that your carrier may well be able to detect that you’re tethering—and may charge you extra for that data usage in accordance with the carrier’s plans. Apple has not responded to our request for comment regarding the app’s approval to and later removal from the App Store. The company behind iTether published a statement on Tuesday in light of the app's removal, claiming that Apple cited the fact that the app “burdens the carrier network” in explaining the decision to unapprove it—even though, Tether claims, Apple understood the app’s primary function before it was released. Writes Tether: “Our team is very disappointed in Apple’s decision; as we strongly believe we help carriers better monetize their data stream by pushing customers into new data tiers further increasing their bottom-line.” The company says to “stay tuned” for further developments. Updated at 8:53 a.m. PT to reflect that the app has been pulled. Updated at 11 a.m. PT with statement from iTether’s developers.